There are perks to being a Foodie. I love that people ask my advice on recipes and ingredients. Skippy invited me taste her green tomato chutney she thought went terribly array, like a food doctor. “But now what do I do with it?” she asked. Once the chutney cooled, the flavors mellowed and the sugars dissolved, presenting an end product that was actually quite wonderful. She didn’t need anything from me except a bit of confidence. Through work I end up with “samples” from vendors. My pantry is sprinkled with gourmet cookies, fruit spreads and a few salami chubs straight from the factory. It’s not a bad life. But best of all, friends and coworkers give me food. There were the heirloom tomatoes from Melina, the house smoked salmon from Gloria, the still-warm eggs from Skippy and the homemade apple butter from Bob. People feel pride (or over abundance) and want to share the things that are so personal and special to them. It’s not uncommon to dine at Marko’s house and have a piece of fish he caught himself. Of course we wouldn’t expect him to provide everything on the table. But if we all come together with the things we love and have taken the time to prepare, then it’s actually a very special collaboration. On the surface it’s a jar of this or a bag of that, but at the core of this giving is a community. We are feeding each other with the gifts of our urban jungle. Recently James went foraging for chanterelle mushrooms. He arrived home with a 7.4 pound box of hand foraged ‘shrooms and wanted to know if I wanted some. “Oh my God YES!” I said, making a mental note to get him a really nice Christmas gift. After a bottle of champagne to split among the four of us and a paper bag of chanterelles, I headed home feeling pretty lucky to be part of this amazing community. Sharing IS caring. This recipe was adapted from La Tavola Marche, a farm, cooking school and villa in Italy. Through friends I was connected with Le Merche and Eddie and I will be visiting next September to take a few cooking classes, forage for truffles and explore the surrounding areas of Piedmont. In the meantime, I’ll keep the kitchen humming with community grown food. Foodie Note: If you are using truffle salt but don’t want the truffle to be too intense, use it first (to taste) then switch to kosher or sea salt. Rehydrate porcini in a bowl with 1-½ cups boiling water, covered, for 30 minutes. 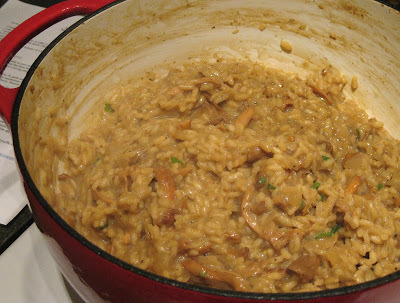 Strain mushrooms but reserve liquid for risotto. It will have a strong porcini taste. 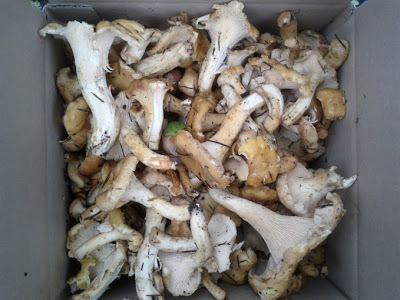 Pull the chanterelles into smaller pieces (as you would shred chicken). Set aside. Bring stock to a boil in another pot. Heat the oil in a dutch-oven over medium-low heat. Add onion and garlic, sweat for 10 minutes without browning. Add all mushrooms and sweat slowly until tender with a little stock to ensure nothing burns. Season with sea salt and pepper. Raise heat to medium-high; add rice, sauté for a minute or two. Add the porcini liquid and let it cook out. Add a ladle-full of hot stock and cook, stirring constantly, until it has been absorbed into the rice. Continue adding the stock, one ladle at a time, constantly stirring, until each addition has been absorbed. When the risotto has about 2 cups of stock left to go, add the wine, stir, as you would stock. Continue adding stock until absorbed. This will take 18-20 minutes. 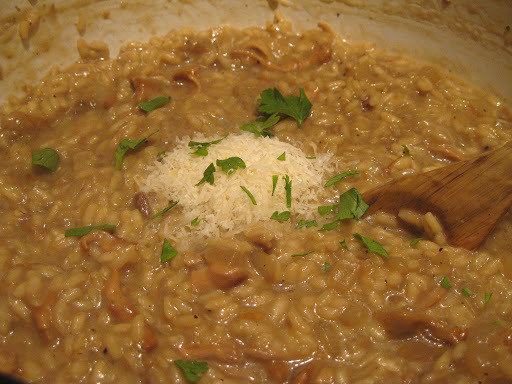 When the rice is al’dente, turn off the heat, add in a handful or two of grated Parmigiano Reggiano, a bit of chopped parsley, truffle or sea salt, and pepper. It’s important the rice still has a bit of bite (al’dente) because it will continue cooking in the liquids even as you serve it. Rice should be thick and creamy, but not runny. Cover the pot and allow the rice to sit for a couple minutes. To serve, spoon the rice into each bowl and drizzle with truffle or extra virgin olive oil. Enjoy immediately!